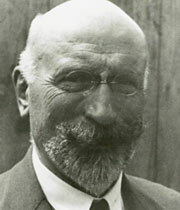 Swiss structural engineer Robert Maillart revolutionised the use of reinforced concrete. His work on bridges and building frames challenged the accepted design methods of the time, and resulted in graceful structures of inherent strength and apparent simplicity. The slenderness of the elements is astonishing in contrast to the massive constructions of his contemporaries in the first part of the 20th century. "Reinforced concrete does not grow like wood, is not rolled like steel sections, is not jointed like masonry. It is more comparable with cast iron, another material cast in moulds, in which through long experience shapes have been developed which lead easily and gently from one constructive element to the next without any shock or sudden break. It is the overall view which, integrating the parts into the whole, conditions these lovely shapes. The builder of aeroplanes and motor-cars has already acquired it to a high degree, but in reinforced concrete construction it is only rarely met with. An innate sense of beauty is not the only thing that can awaken desire to visualize the structure as a whole rather than as an assembly of parts. The overall view always presents economic advantages." Maillart's 46-year career encompassed more than 300 projects. Around two-thirds of them were buildings, where he changed the accepted view of floor slab (Giesshübel warehouse, 1910) and roof (Maggazini Generali, Chiasso, 1925) designs by making them beamless. However, he is probably best known for bridges — notably deck-stiffened arches (Schwandbachbrücke, 1933) and three-hinge arches (Salginatobelbrücke, 1930). A feature of all his work is the deliberately-visible formwork board marks on the surface of the concrete. Maillart was using 'traces of the human hand' half a century before Peter Rice (1935-92) made it his trademark. As both engineers discovered, it provides a poignant connection between the observer and the designer that is independent of the time lapse between observation and construction. Maillart worked mainly in Switzerland, with a spell in Russia, which may be why his name is not as generally well known as other concrete pioneers such as François Hennebique (1842-1921), Louis Gustave Mouchel (1852-1908) and Eugene Freyssinet (1879-1962). He certainly deserves wider recognition. 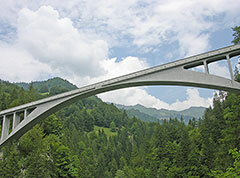 The single 90m span of the Salginatobelbrücke (1930) soars across an alpine ravine, 93m above the valley floor. Maillart's reinforced concrete arch is only 200mm thick at its crown. 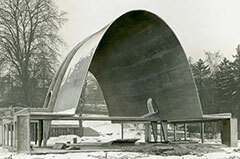 Maillart's temporary Cement Hall, designed with architect Hans Leuzinger for the Swiss National Exhibition of 1939. The idea was to show how little concrete is needed for a robust structure.